Every release of a new 16:9 monitor should be met with protest by anybody that's not prepared to settle for mediocrity. This week's new entry comes in the form of LG's 21:9 29MA73, an ultra-wide all-in-one PC with a display that takes an already frustrating aspect ratio and stretches it to the point of tedium. It's as if LG and others think that adding more horizontal pixels makes up for the lack of vertical space. It doesn't. It just means that the thing is more likely to fly when you hurl it off the edge of a cliff. The fact is, any 16:9 display is a downgrade from the 16:10 models that were both common and easily affordable a mere five years ago. 16:10 is often referred to as the 'golden ratio', and it didn't earn its name for nothing. Back in 2008 I picked up a 16:10, 24-inch monitor with a 1920x1200 pixel-resolution for a mere £140. Granted, it lacked a HDMI port, but the vertical space it afforded was nothing short of revolutionary for my productivity levels. At last, two A4-sized documents could be pinned side by side perfectly, there was ample room for positioning the canvas and windows side-by-side in Photoshop, and FTP programs could sit alongside browsers for nippy website editing. Games were given a new lease of life too, with PC titles such as GRID possessing a simulator-like quality. Even PES, which ruled the football seas back then on the Xbox 360, benefited from the extra top and bottom space as you squared the ball across the wings. The time when such a monitor could be picked up for a sensible price was short lived. 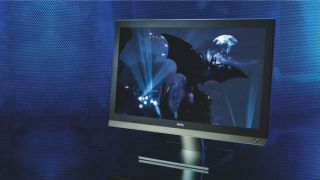 From late 2008, vendors such as BenQ began to recognise that 16:9 panels were cheaper to manufacture, and the aspect ratio became the adopted standard. The move was attributed to the rising dominance of DVDs and games consoles, which are displayed in 16:9. Though it's true that today you can get hold of an IPS monitor with a 16:10 resolution that will display both types of media without a hitch, good luck finding one less than £350. If we're being realistic, a decent one will set you back closer to £700. And don't even get me started on the deluge of 16:9, 27-inch PC monitors featuring a 1920x1080 pixel-resolution. Think the Millennium Dome was a colossal waste of space? You haven't seen anything yet. A good example of how nonsensical the situation has become can be seen in the two iMac sizes currently offered by Apple. At the lower end is the smaller 16:9, 21.5-inch model featuring a 1920x1080-pixel-resolution, which is dwarfed by its larger, 27-inch cousin that possesses a res of 2560x1440 pixels. What happened to the 24-inch, 16:10 iMac that formed a suitable middle option? It was the perfect size for most desks, didn't break the bank and provided ample real estate for games or getting things done. It was killed off, forcing you to choose between the diminutive entry-level desktop or its whopping great alternative. The consumer's loss of choice became Apple's gain, which is a shame because the 24-inch version had it nailed. The 16:10 ratio, it seemed, had completed its transition into something of a luxurious niche. It may be true that 21:9 is a more suitable aspect for TVs, the majority of which are designed for streaming movies, or can be connected to Blu-ray players and consoles. But so long as manufactures continue to peddle PC monitors with it, mediocrity in that space will undoubtedly remain the norm.